PlayOJO is the first casino ever with no wagering requirements on free spins and bonuses! Open a new acocunt via our special links, make your first deposit and PlayOJO Casino will give you 1 Free Spin for every €1 you deposit up to 50 Free Spins! Not bad for an online casino! 1. Open a new account with PlayOJO Casino via this special link! 2. Each time you spend £1 you’ll get 1 free spins, up to 50 free spins with NO WAGERING REQUIREMENTS! Play OJO is new to the world of online casinos, launched on 1st February 2016 and licensed by the UK Gambling Commission. It comes with a strong customer focus and a revolutionary philosophy. It's the first online casino completely transparent, clear and simple! All winnings generated by free spins are paid in cash and do NOT have any wagering requirements or hidden terms ...so everything you win, you keep!! Play OJO is a very modern and playful casino, with a fair play attitude that puts the users back in control of their money and winnings. There are over 500 slots and games from the most tknown developers such as NetEnt, Microgaming, Barcrest, WMS and NextGen. 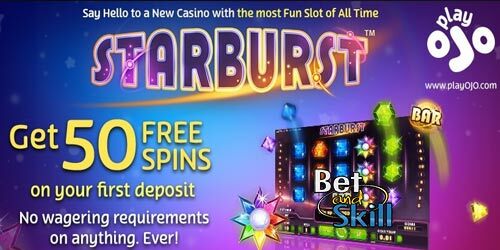 The stand out games of the moment include: Mega Moolah, Dragonz, Rainbow Riches, Gonzo’s Quest, Foxin’ Wins, Starburst, Thunderstruck II and Immortal Romance. "PlayOJo Casino 50 free spins bonus - no wagering requirements"